You may have noticed that we just featured 22 year old, Francesca Chaney, who recently opened a soy-free vegan restaurant in Brooklyn. Now, we are just hollering that we got to connect with yet another young MelaninASS entrepreneur. 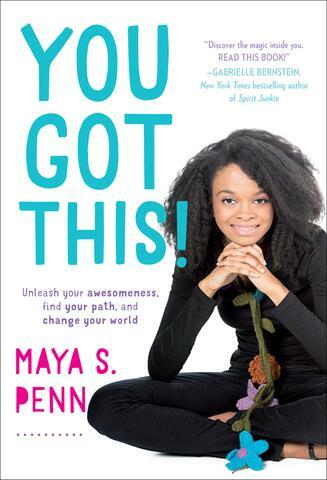 MAYA PENN, is an 18 year old eco-friendly designer and author. The sheer site of connecting young Black women who are Vanguards in sustainability spaces and who are aware of the importance of representation and accessibility is beyond beautiful. You founded Maya's Ideas in 2008 - at a time when sustainable fashion was not super mainstream - what inspired the start of this company? I’ve always had a passion for art and design, including fashion design. I’ve also grown up in a really eco-conscious household. So when I had an idea to start a fashion line, I was naturally inclined to start doing my own research on the fashion industry and it’s environmental impacts. What I discovered was mind-blowing, and I was shocked that sustainable fashion wasn’t in the mainstream. So when I created my fashion brand, I knew I wanted to make my pieces sustainable. fashion from organic, recycled and vintage materials. How do you define sustainability? What does environmental activism really mean to you? I think the core of sustainability is having a sort of “eco-consciousness”. We all leave an impact on the planet, and environmental activism starts in monitoring that impact we make as individuals. Consumers are realizing that they can speak with their dollars, and brands are starting to take notice of the trends. The global eco-fibers market size is projected to reach 74 billion dollars in value by 2020. This is really exciting news and it really shows the impact of consumer interest in sustainable fashion alternatives and textiles. This type of impact can also reach beyond the fashion industry. It’s all about awareness, and what we invest our, money, time, and energy in as individuals. Where do you see the future of ethical fashion? I think as more consumers become educated on sustainable and ethical fashion, major brands will have no choice but to make a shift into a more conscious direction in order to accommodate their customer base. An example I like to give is how the food industry shifted and how it is continuing to shift to accommodate the needs of consumers that want options that are organic, non-GMO, vegan, gluten free, etc. Fashion brands will really have to take a step back and figure out how to make the life cycle of each piece sustainable and ethical. As a young woman of color - does that at all inspire your brand? If so, how? In a lot of my designs and original artworks for my pieces, I include art and imagery that eco-conscious women and girls of color can see themselves in. A great example is my “Nama-stay Woke" or “I’m a Natural Beauty” T-shirts. Despite the amount of people of color that are part of the green/holistic/sustainable communities, there is a strong lack of representation of us in those areas. What has been the greatest beauty and toughest challenge of entrepreneurship? The greatest beauty for me has been witnessing how I’ve inspired other aspiring entrepreneurs and creatives of color, to not only start their own businesses, but to give back through their businesses, and create brands that are environmentally and socially conscious. It’s also been amazing to have the opportunity speak around the world and educate others on sustainable fashion. As for the toughest challenge, as a business grows you have to recalibrate how you run it. Your mindset and business methods have to grow and evolve along with your company. Some of the methods I might have used starting out don’t serve me now. As a business owner it’s important to avoid stagnation, experiment, and reinvent aspects of your business when necessary. This often comes with a learning curve, but, it is vital in the long run. What are some exciting things that you're working on at the moment? I’ve been really focused on scaling my business, and I’ve been working on some new designs and experimenting with new sustainable textiles. It’s incredibly exciting. I’m also an animator and filmmaker and have been working on some animated projects surrounding environmental topics.